They can take us to court. They can send us to jail. They can target us with a fatwa. They can take away our freedom. But they will never silence us. They will only make us stronger. And more determined. To speak out against Islamization. Tommy Robinson holds the same opinions on Islam as Winston Churchill, and he is not afraid to say so” – Geert Wilders. But, hey: doing something about it would be “Islamophobic”, or something…. 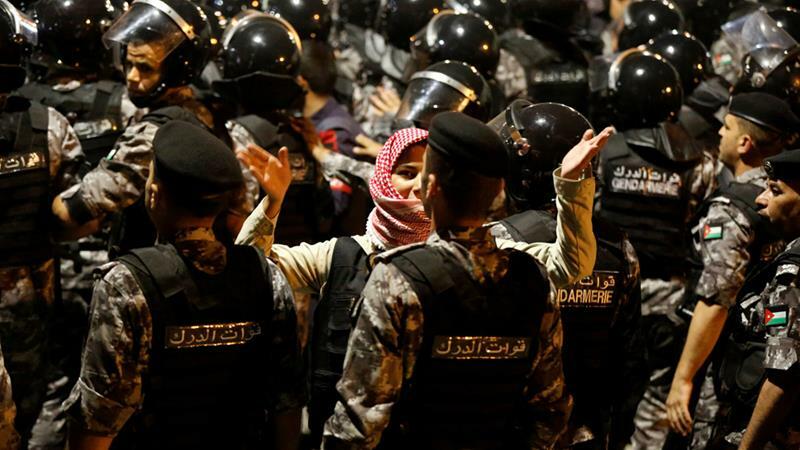 Is this the beginning of the end for the plucky little king of Jordan? Very well, then. It is odd, however, that we never used to hear about these incidents in cathedrals, and now they’re fairly common — there was one in France just last week. This was Berlin’s main Protestant cathedral, so perhaps this 53-year-old “Austrian man” was just a disgruntled Roman Catholic. Or perhaps German authorities are once again trying to cover up jihad activity. In light of how intent German authorities are not to let news of jihad activity come out in a manner that makes it clear to the public what is going on, we may never know what really happened here. Notice that “Hate Harms the Soul” is written outside the cathedral in German and English. Not in, say, Arabic. But it is unlikely that this attack was carried out by an anti-immigration Trump supporter. Italy’s new government: What’s next for immigrants? Muslim migrants. Nothing in the world is more concerning for Qatar’s MuBros & al Jazeera, their worldwide propaganda channel. Go To Hell … or any islamic country!!! No problem was ever solved by ignoring it, and we aren’t doing even any of these muslims (whose own ancestors were among Muhammad’s first victims) any favours by going along with any of their historic lies and alibi excuses for their crimes. Pretending islam is just another religion like all the others, hijacked by some con-men, is wrong. That’s only a parochial, Western-based and ethnocentrist approach to islam. Islam is NOT only not a real religion which could be and is sometimes only occasionally misunderstood and/or taken advantage of by a few evil persons. It’s not also – as are all the other, “real” religions – only an opinion presented as a fact (i.e: only a simple case of delusive criminal fraud)! Islam is really an actual threat to everyone because IT says it is, not because we misinterpreted it. The Qur’an is more than just another flawed book of confusing, contradictory superstitious nonsense, it’s evil. The Qur’an is a clearly-written, us-versus-them hate-crime book, endorsing a permanent might-makes-right death-threat. In fact, it’s quite accurate to note that the Qur’an is what you’d get if Hitler had written the Bible. The Qur’an tells it’s muslim mind-slaves that they are in fact SO “superior” to all the non-members of their war and plunder cult, that it’s not only their right, but also their holy duty to their god, to extort, enslave, and murder all the non-muslims in the world, simply for the “crime” of not being muslims! SO -and according to only their own Eastern histories – islam has an official 1,400 year history of “holy” lies, extortions, robberies, tortures, arsons, kindappings, slaveries, rapes and 270 million murders: that’s OVER A QUARTER-BILLION INNOCENTS SACRIFICED TO ALLAH, so far! Islam has a larger death-tally than that of EVERYONE ELSE, both secular and religious, COMBINED, and with an historical average of less than 1% of the global population to have committed it with, too! Do the math: 270 million divided by 1,400 is almost 200,000 per year, or over 500 per day, or over 20 per hour or about one person every three minutes being murdered by Muslims ever since Islam was founded. So, simply and precisely because of their “THOU SHALT KILL!” (Qur’an 2:191, 4:89, 9:5) cultural indoctrination, MUSLIMS ARE STILL FROM BETWEEN FOUR AND SEVERAL HUNDRED TIMES MORE LIKELY TO ENGAGE IN MURDER (and all other crimes,) THAN EVERYONE ELSE IN THE WORLD! Islam is the greatest ongoing threat to humanity the world has ever yet known. But, to leftopaths, when islamic terrorists attack Infidels and then the infidel says please stop, that is the cause of the attack. The Qur’an and islam itself should be banned, and all muslims resisted and exiled, because everything muslims pretend to believe is “holy” is already a crime!